An import from Germany which has English actor Christopher Lee's voice dubbed back in English. 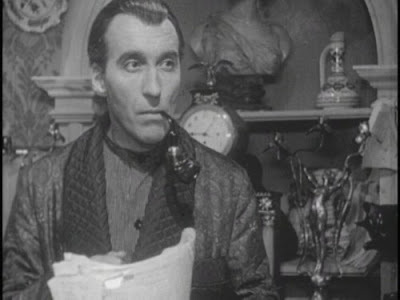 Lee makes a good Holmes as he once again pursues Professor Moriarty. One of Holmes informants is killed on the way back to deliver him a message but leaves a clue for Holmes and Watson to follow. Holmes discovers that a Cleopatra's necklace, discovered by archaeologists has been stolen by Moriarty. When Holmes meets with Moriarty, the Professor asks Holmes to former a partnership with him. Holmes tells him that he hopes to see him hanged. The movie probably was better in the original German. The dubbed voice of Holmes was particularly distracting considering how much of the Holmes character is dependent on his verbal ramblings. Thorley Walters went on to play Dr. Watson again in The Adventure of Sherlock Holmes' Smarter Brother. This was not a great entry in the series, but Lee did make for an interesting Holmes.